Links of websites providing list of universities (accredited/blacklisted) with relevant details. are more specialised and three universities focus specifically on technical studies (TU Delft, TU Eindhoven and Universiteit Twente). Almost one fourth of all programmes in higher education in the Netherlands are offered in English. with an academic as well as a professional orientation. programmes, these institutions are allowed to offer bachelor and master's programmes. and are only allowed to offer postgraduate programmes. These programmes have to get (initial) accreditation. The overall security as well as law and order situation in the Netherlands is satisfactory. Schiphol Airport in Amsterdam is the biggest international airport in the country where travelers fly in from most countries in the world. The airport is connected by train to most of the larger cities in the Netherlands such as Amsterdam, Rotterdam, The Hague, and Utrecht among others. The Netherlands has a well organized public transport system, both within and between cities consisting of train, metro, tram and bus networks. The dense railway network which offers frequent service is the quickest and most economical way to travel between cities. with travel credit at public transport service desks, ticket vending machines in stations, as well as several supermarkets. of biking paths. Cycling in the Netherlands is much safer and more convenient than in other countries, because of the infrastructure viz. cycle paths, cycle lanes, and signposted cycle routes. In addition to bicycles, public transport and cars, you can also rely on taxis, although they are expensive. It is possible to take a taxi to your destination from any Dutch airport. There are permanent taxi stops in many cities (particularly near popular squares, attractions and stations). Uber, the mobile app based alternative taxi service is available in major Dutch cities. Culture & Science and the Dutch Ministry of Foreign Affairs as contract partners. of the quality of higher education in the Netherlands and Flanders. 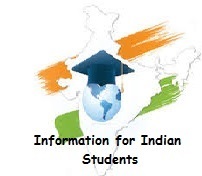 http://studyinnetherlands.eu/ : Web portal run by a group of Indian Students studying in the Netherlands. Indiawijzer : http://indiawijzer.nl/ - Indiawijzer is an information portal.